In the town where country music was born–where two states come together on one street–a spark lit and a duo was ignited. At the 2012 Bristol Rhythm and Roots Reunion, on the way to take the stage with his band, Sol Driven Train, guitarist/singer Joel Timmons found himself sidetracked by Della Mae, an all-female, GRAMMY-nominated bluegrass band. It was that group’s bass player, Shelby Means, who most captivated his attention. After a conversation at the merchandise table about their shared love of travel and music, two-years passed before Means and Timmons would reconnect. 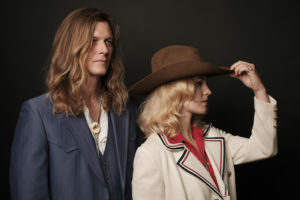 A bold love song led the way, and eventually a growing romance turned into the Nashville-based duo Sally & George and their debut album tip my heart.